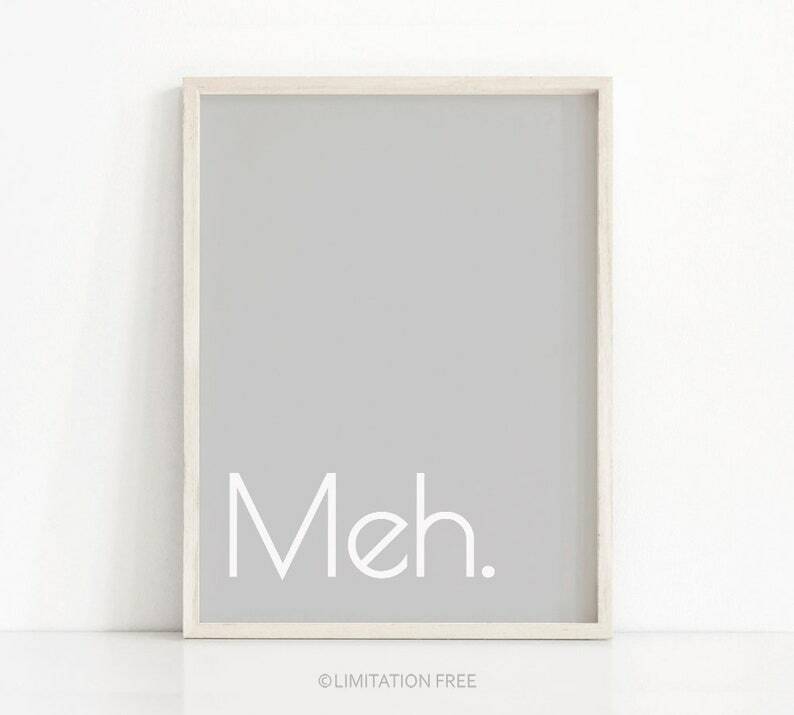 Digital download printable art, modern minimalist typography poster "Meh" for your bedroom, office or home decor. The files will be delivered electronically within minutes of your order and payment. An email will be sent to the address you have associated with your Etsy account with a link for your download. Due to different monitor calibrations note that colours may change slightly from monitors to print. Final print quality will depend on the type of printer and paper used. For an amazing result get your Digital Art printed at any photo center, but you can also print it with your own home printer. All designs, typography and illustrations have been uniquely created by me and are for personal use only! The product can not be used for commercial use or be resold/redistributed by electronic means or profit in any way without written permission and licensing from Limitation Free! Easy to download, print, and hang. Looks great in my baby's room! Lara provided customized sizes to 20x30 inches because I wanted a bigger resolution for my living room! I loved how these came out and would buy from this cute shop again. Can I get my files in other size(s) than those listed? You can get the files in any size you need for no extra charge. All you have to do is to purchase the listing you wish to have and let me know in the note to seller the size you wish to receive. Can I get the art in different color? Do you offer printing & shipping services?